Ajută-ne să informăm cât mai mulţi oameni despre ce înseamnă lupusul! 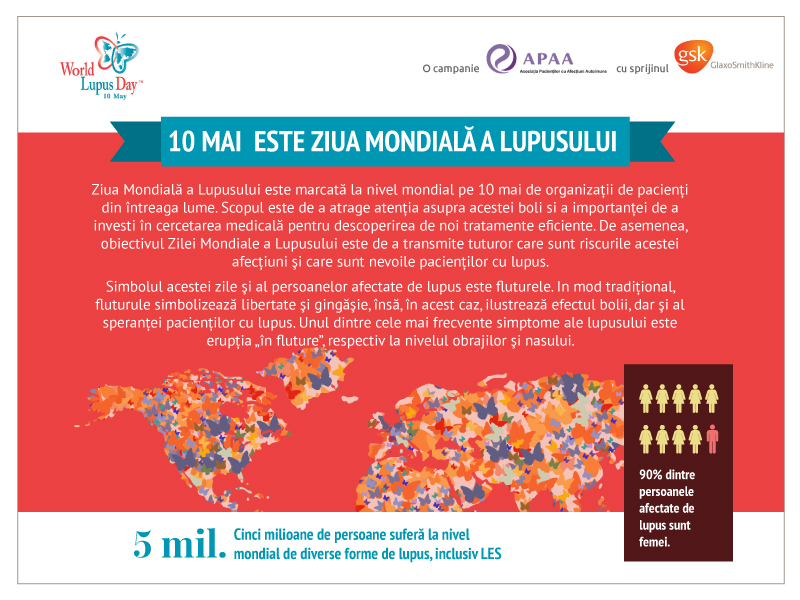 Ghidul "25 de răspunsuri pe care le caut atunci când am lupus" este distribuit gratuit de către asociaţiile de pacienţi şi medici. NHS Choices – Lupus. http://www.nhs.uk/conditions/lupus/pages/introduction.aspx Accessed on June 6, 2011. National Institutes of Health. National Institute of Arthritis and Musculoskeletal and Skin Diseases. Understanding Autoimmune Diseases. Available at: http://www.niams.nih.gov/Health_Info/Autoimmune/default.asp. Accessed on February 16, 2011. ("The Immune System" subhead, para 1-2). Lupus Foundation of America. Statistics on Lupus. http://www.lupus.org/webmodules/webarticlesnet/templates/new_newsroomreporters.aspx?articleid=247&zoneid=60 Accessed on July 5, 2011. Kalunian K, Merrill JT. Curr Med Res Opin 2009; 25: 1501-1514. Medscape Pediatric Systemic Lupus Erythematosys. Available at: http://emedicine.medscape.com/article/1008066-overview. Last accessed on 14th July, 2011. Lupus Europe: Lupus. Available at http://www.lupus-europe.org/lupus/ Accessed on July 4, 2011. Zonana-Nacach A et al. Lupus 2000;9:101-109. The Patient Education Institute. Available at: http://www.nlm.nih.gov/medlineplus/tutorials/lupus/id209104.pdf Last accessed on 13th July 2011. ACR Ad Hoc Committee. Arthritis Rheum. 1999;42:1785-96. Stephens, Stephanie M.A. Neurology Now. Lupus and Your Heart: Two's a crowd when it comes to lupus and cardiovascular problems. July/August 2010 edition; Volume 6(4); pp 19,23–25 Available at: http://www.aan.com/elibrary/neurologynow/?event=home.showArticle&id=ovid.com:/bib/ovftdb/01222928-201006040-00013#P28 Accessed July 5, 2011. ("A Difficult Diagnosis" subhead, para 1). McElhone K et al. Lupus 2010; 19:1640-1648. Doria A et al. Systemic lupus erythematosus (SLE) is costly for the healthcare system and workplace: a systematic literature review. Presented at European Lupus Meeting 2011, April 6–9, 2011; Porto, Portugal. Abstr P140. Yelin E et al. Arthritis Rheum 2007; 57: 56-63. Rahman A, Isenburg DA. N Eng J Med 2008; 35: 929–39. Berker-Merok A, Nossent H. J Rheumatol 2006; 33: 1570-1577.